We are attempting to take a picture of Evan every week for his first year. How likely does this seem to actually happen? Let's face it, I'm a mess but I'm going to make every effort to keep up with this plan. That's his wire "E" that we're going to throw in every picture so you can tell how he's growing. Sweet little monkey boy! And here is how I'm fairing one week on. I look like I'm about six months pregnant but I'm assuming that's all the swelling from the surgery ... and yeah, I just had a baby a week ago. Whatever. I'll be able to exercise in five more weeks & I am looking forward to getting into some sort of shape. A triangle would be nice. BWAHHAHAHAHAHA!! 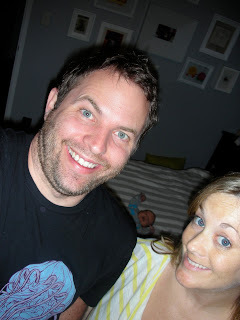 And that's Evan's little nursery corner back there behind my crazy face. I still have to put something up in that bottom corner before it drives me nuts. And here's my handsome husband, who's obviously got full control of his senses as well. Happy happy home! Lucky Ben got to sleep before this little photo shoot but he's doing pretty darn well too. I am fully aware that there is a little delusion with your first week or two of having a newborn. Yeah I'm tired, exhausted & sleepy but I don't feel bad. I remember feeling like this last time & I know there's a dark turn up ahead if I don't start taking advantage of my gorgeous helpers (Marcel & his wonderful mother!) & take some naps here & there. Suddenly the tiredness becomes overwhelming & you start teetering into anxiety & throw in the new mama hormones & there can be trouble. But right now I feel pretty damn fantastic! We'll keep on trucking & I can't wait to see what adventures our newly complete family has in store for us. Mr. So & So, I am a lady.